The oceanfront is calling and there is room for your family at the oceanfront North Myrtle Beach resort of Buena Vista. This North Myrtle Beach resort ensures that every family in every one of its North Myrtle Beach condominiums has an oceanfront view, a direct oceanfront view. Buena Vista is in the Cherry Grove section of North Myrtle Beach, South Carolina and it is a North Myrtle Beach resort that offers far more than a wide variety of condos in North Myrtle Beach, South Carolina. Buena Vista has seven floors of North Myrtle Beach vacation rentals built on top of a four-level parking garage. Elevators are found in the middle of this North Myrtle Beach resort, making it easy to ride up to your floor from the parking garage and quickly find your North Myrtle Beach condominium. For those who prefer the climb, stairs are located at either end of the hallways at Buena Vista. What is most charming about this North Myrtle Beach resort is the location of its oceanfront pool deck. It is on the fourth floor and it faces the Atlantic Ocean. The swimming pool glistens in the sunlight and the kiddie pool is right next to it. From this fourth-floor pool deck your family will really be able to see the beaches because you are up high enough to observe over the top of the dune line. Of course these same oceanfront views may also be enjoyed from the privacy of your oceanfront balcony, which also looks over the pool deck. The North Myrtle Beach rentals at Buena Vista differ in size as there are one-, two-, three- and four-bedroom North Myrtle Beach condominiums at this North Myrtle Beach resort. Some of these North Myrtle Beach condo rentals are specifically designed to sleep a family of four while others may accommodate as many as 12 people, perfect for a Myrtle Beach golf vacation with all your golf buddies. While the furnishings and contents of each North Myrtle Beach rental at Buena Vista is different, some things are the same about every one of these condos in North Myrtle Beach, South Carolina. 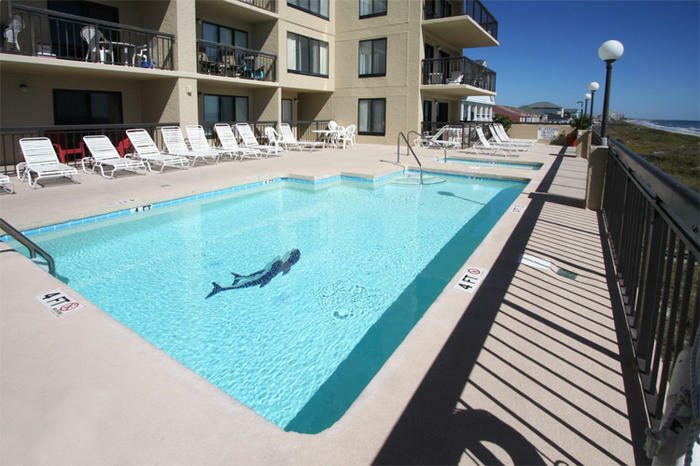 All of these North Myrtle Beach condo rentals have Internet access. Bring your laptop computer and get online during your North Myrtle Beach vacation at Buena Vista. Relax with a cup of coffee and look at the things to do in North Myrtle Beach, South Carolina. Check out store hours, restaurant menus, online discounts and show times without ever leaving the comfort and privacy of your own North Myrtle Beach condominium. All of these North Myrtle Beach condo rentals also have a washing machine and clothes dryer for you to use during your stay at Buena Vista. Almost of these condos in North Myrtle Beach, SC have a DVD player and numerous televisions so you can watch your favorite movies while your family stays at the beach. Elliott Beach Rentals is not affiliated with onsite management or the HOA of Buena Vista.